The objectives of the Order of Souls concern the killing of the skeletons and in particular of their bosses. In this guide, we will address both the Order of Souls in order to facilitate the completion of its objectives. 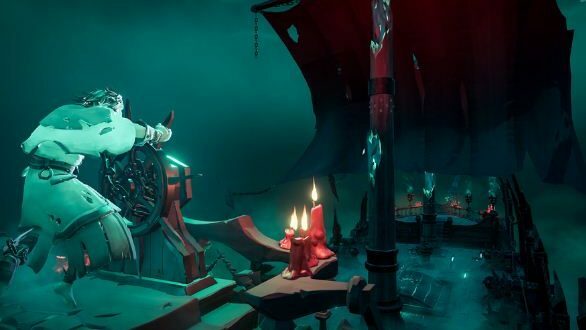 If you are also interested in more general advice, to help you get the best out of your experience, we recommend the guide to take the first steps in Sea of Thieves. The best way to move forward within the Order of Souls is to carry out the corresponding missions. If you are not yet a member and want to join the Order of Souls, it is sufficient to look for any standard of banners that represent a stylized white eye on a purple background. The buildings that present this banner are in fact the headquarters of the Order. Head inside, choose one of the available trips, return to the ship and vote – as usual. At that point, you will see the island where your target is on the ship’s map. Once you reach the island, free yourself of all the waves of skeletons that will pour against you: once defeated the “small fish”, will come out to discover the true goal of the size – a skeleton “boss” decidedly harder to break down. Defeat him, take his skull and return the latter to the settlement to deliver it to the Order of Souls; keep in mind, however, that it is not obligatory to return to the headquarters of the Order in which you have accepted the mission: any office scattered around the gaming world will be fine. Another way to advance within the Order of Souls is to confront the captains of the strong, overflowing structures of skeletons whose location is occasionally indicated by immense skull-shaped clouds. When you see such clouds, follow them: they will lead you to the fort, to the relative boss and, consequently, to gain experience for the Order of Souls. Just remember to bring the skull of the boss with you, as usual. Given the fundamental randomness of the appearance of the skull clouds, we advise you to follow them every time you see them appear. It is worthwhile to dwell on the method of progression within the Order of Souls. In fact, those who are still in the very first stages will have noticed that none of the exclusive prizes guaranteed by the Order are currently available; in fact, to access the “juiciest” contents, it will be necessary. At that point, you can buy a promotion that will guarantee you a title and with it access to premium prizes. Of course, a greater reward will correspond to a greater difficulty, as well as an “entry price” to obtain the missions. Bananas -Always try to get yourself an abundant supply of bananas whenever you intend to embark on a battle. Although the advice may seem obvious, we want to underline it: being surrounded by skeletons without any way to cure itself can be very, very unpleasant. Eye to the ammunition -The golden council. As long as the number of enemies is not overwhelming, try to save on ammunition and rely on your saber. You will be grateful to have done it especially once you reach the boss. Several skeletons, different strategy -Each skeleton represents a different threat. Just like the living pirates, the undead takes up various types of weapons: always try to take into account the dangers posed by each weapon, before launching into a blind melee. Particular attention should be given to the skeletons that take up firearms: surprisingly, their aim is not so low. In this sense, you can wait for them to shoot and advance towards a safe cover, then hit them with the saber when you are close enough; alternatively, it may also be a good idea to reserve one of your precious projectiles, especially if the situation is quite crowded. Know, then, that when you level up with the Order of Souls you will begin to undertake missions that involve the killing of particular types of the skeleton . Predictably, you will have to pay close attention by fighting with these special skeletons; just know that the golden ones are weak to water, which slows them down (a good idea, in this sense, could be to use the bucket with which you throw out the water from the ship), while the dark ones are weak to any type of light . To the cannons! – Your ship remains the strongest weapon at your disposal, even in the fighting on the ground. If you bring it close enough to the shore of the island, you can use the cannons to help the comrades fighting on the ground.